Registration for the Great Ski Race is now open. The 30 kilometer Nordic ski race will be held March 3rd, 2013. 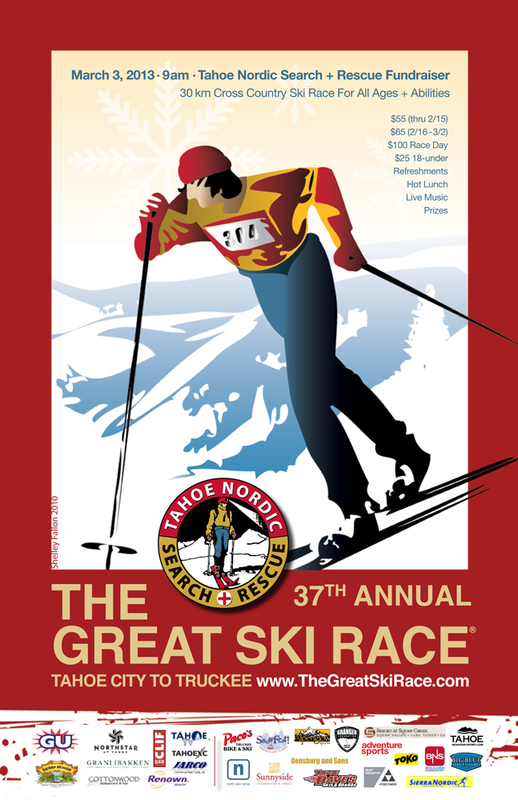 This year will mark the 37th anniversary of this fundraising event for the Tahoe Nordic Search and Rescue Team. The race was cancelled last year due to lack of snow. The Great Ski Race begins at the Tahoe Cross Country ski area in Tahoe City and ends at the Hilltop Lodge in Truckee. The entire 30 kilometers will be machined groomed with skating lanes and double tracks. Racers are started in waves, based on ability and past times. The fastest recorded time is 1:06:51 from 2008. The slowest time is around 7 hours. Everyone is invited to race, but the remoteness of the course makes it not advisable for beginners. The cost is $55 through February 15 with a bump to $65 up to March 2nd. Race day registration is $100. The price is $25 before race day if you are under 18. The Tahoe Nordic Search and Rescue Team (TNSRT) was organized in 1976, when a young skier, Lance Sevison, became lost on the backside of Northstar. At that time, there was no organized team to search for the boy. A search party was organized, but not in time to save Lance. This tragic event triggered the formation of TNSRT.